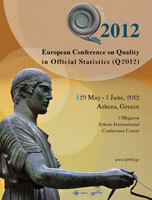 The European Conference on Quality in Official Statistics (Q2012) was co-organised by the Statistical Authority of Greece (ELSTAT) and Statistical Office of the European Union (EuroStat) on 29 May-1 June 2012 in Athens, Greece. Over 400 participants attended the Conference. Mr. Atilla Karaman, Researcher, represented the Centre thereat. The Quality conferences started in 2001 when the first Conference was held in Stockholm to develop further the conclusions of the Leadership Group on Quality. One of the recommendations of the Conference was to organize Quality Conferences biennially. Starting with Q2001 in Stockholm, five Q-conferences took place including Q2004 in Mainz, Q2006 in Cardiff, Q2008 in Rome and Q2010 in Helsinki. Additionally, a Poster Paper Session took place on 31 May 2012 that exhibited a total of 19 poster papers. Among the poster paper presenters, Ms. Shadia Abu Alzain and Mr. Ahmad Mardawi from the Palestinian Central Bureau of Census exhibited their poster paper “Data Quality of Agricultural Census”, and Mr. Mohamed Galal Eldean Moawad from the Egyptian Central Agency for Public Mobilization and Statistics presented his poster paper “Quality Framework for National Accounts Based on the Statistical Business Register (Opportunities and Challenges). The participants listened to the keynote speech of Prof. Svein Nordbotten, University of Bergen, Norway on the last day of Q2012. Following the keynote speech, the Conference ended with three parallel sessions and a Round Table Discussion on the theme “Was the Quality of European statistics affected by the economic crisis?”.